It’s hard to believe that Christmas is a little over two weeks away! Have you decked the halls yet? 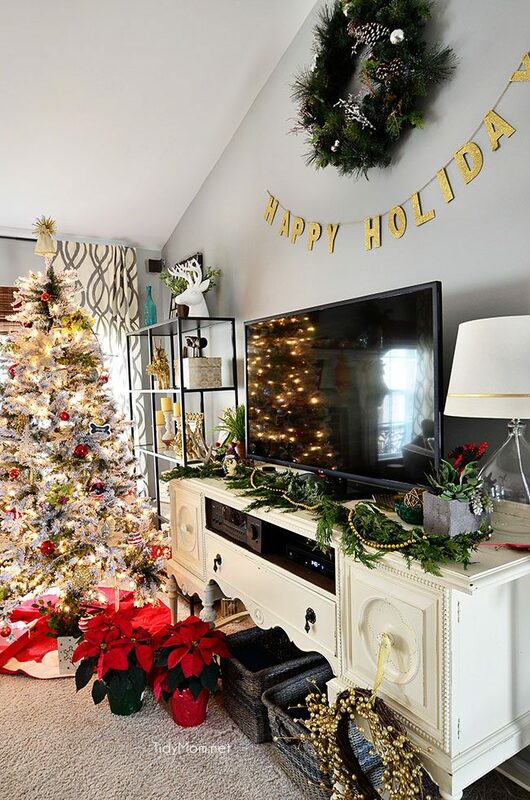 If you haven’t started on your Christmas home decor (or you’re still working on it) I think you’re going to love these festive ideas that linked up to last week’s party. From Christmas table settings and centerpieces to Christmas porches and more! 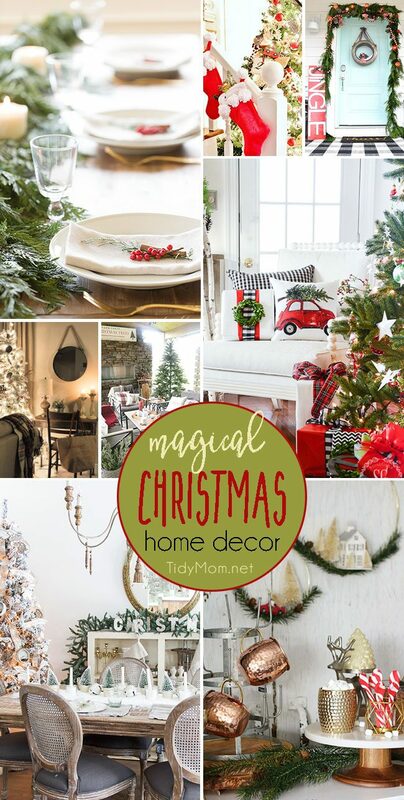 You’ll find tips, tricks and inspiration to make your Christmas Home Decor Magical. Christmas Table Setting with a 5-minute Garland Centerpiece from Julie Blanner. Anyone can create this simple centerpiece – no skills necessary! 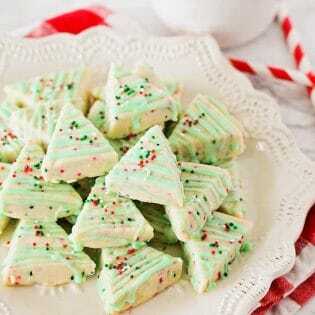 It’s easy but festive and most importantly, classic. DIY Pom Pom Stockings Tutorial at Thistlewood Farms. Karianne says pom-poms make everything look a little more festive……even Dollar Store stockings! Christmas Farmhouse Porch with a Galvanized Holiday Wreath at Tatertots and Jello. It only takes a few minutes to make this galvanized wreath! While you can hang it inside or outside your home, Jen’s looks so cute on her porch with her big plaid black and white rug. Christmas Nights Tour at Cherished Bliss. There’s nothing more magical than your home lit up by Christmas lights at night. Be sure to take that extra second to enjoy the peaceful moments this Christmas. Very Plaid Christmas Decor with Taryn Whiteaker. No matter how cold it is or how hard it’s raining, this outdoor space is always cozy and perfect for roasting marshmallows! 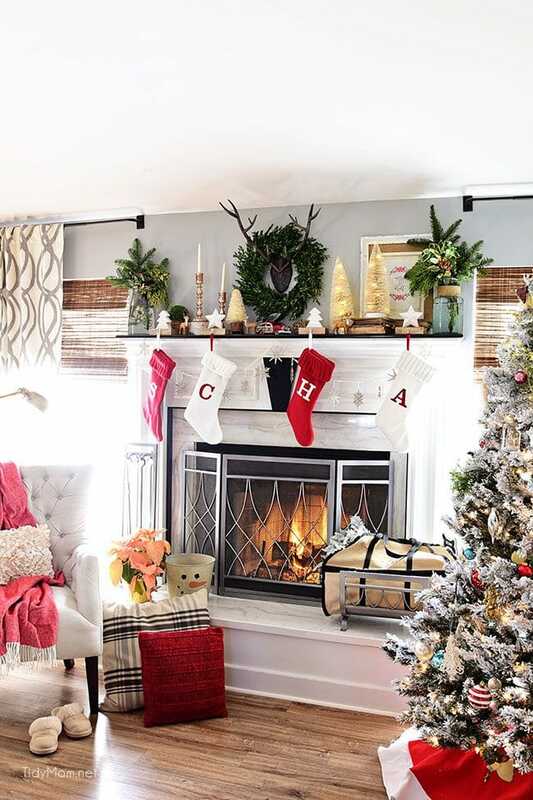 Christmas Decorating Details tips at Stone Gable. Paying attention to details makes all the difference. 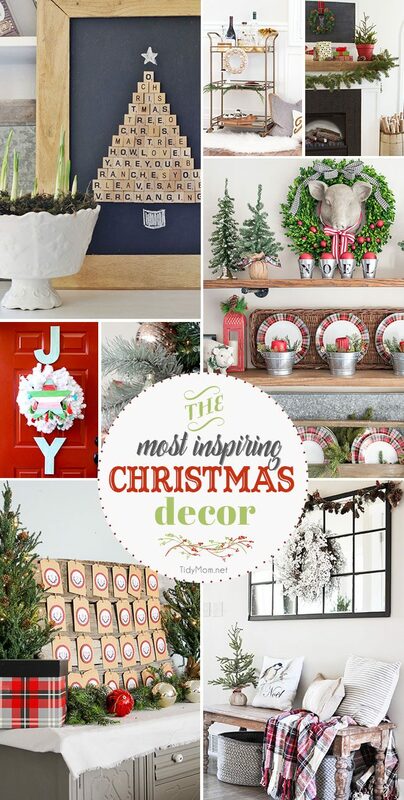 Be simple and purposeful and enjoy Christmas decorating! Christmas Dining Room & DIY Snowy Centrepiece at So Much Better with Age. I’m in love with Jamie’s dining room all decked out for the holidays AND she is sharing how to make a snowy centerpiece that looks like real snow! Easy Hot Chocolate Station at Lolly Jane. Chilly nights and crisp mornings call for a Hot Chocolate Station! This is week 387 (7+ years) of hosting this I’m Lovin’ It linky party. Each week I feature some of the posts that caught my eye from the previous week. Please take a moment to visit the featured blogs ……..then scroll down to see what’s being shared this week. The most inspiring Christmas decor of the season! This time of year you can find us cozied up by the fire with the Christmas tree all lit up most night!! What are your favorite memories of the season? Thank you for sharing so many wonderful projects, recipes and crafts again last week! You casn link up thru Sunday evening or come back next week and link up for another I’m Lovin’ It, who knows maybe next week I will be featuring you! Thank you, Cheryl! I loved seeing your holiday home. I hope your December’s been great, so far! Thanks so much for featuring my dining room and snowy centrepiece! Happy holidays.